It’s easy to think of satellites as technology for observing the realms beyond our planet. But many satellites turn their data-gathering instruments back toward home. That’s how this ocean-currents map was created. The purple and pink swirls represent warmer ocean currents, while the blue and green are cooler currents. Maps like this aid in weather forecasting, determining the temperature of our oceans, and long-term analysis of the oceans’ health. 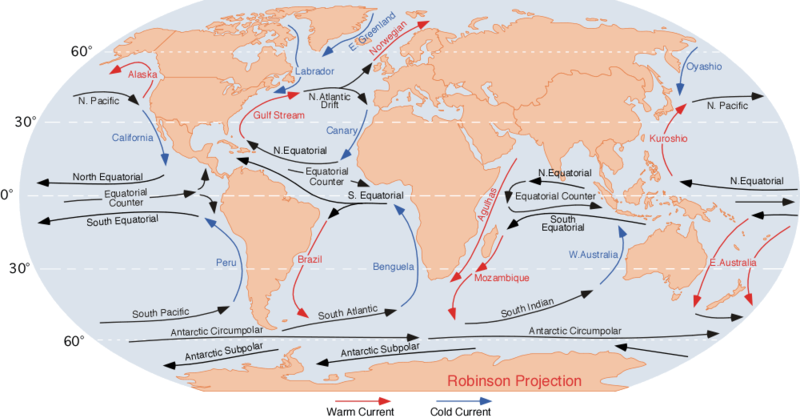 An ocean current is a continuous, directed movement of seawater generated by forces acting upon this mean flow, such as breaking waves, wind, the Coriolis effect, cabbeling, temperature and salinity differences, while tides are caused by the gravitational pull of the Sun and Moon.